REWORKED DINOSAURS, RELOCATED ROYAL MUMMIES, AND THE PAPAL CADAVER SYNOD OF 897 CE. An eternal theme in science fiction, both written and film, is the discovery of dinosaurs still living somewhere in the modern world. They turn up in a remarkable number of places; on the tops of high plateaus in the rain forest, frozen in ice, in suspended animation deep in the rocky crust of Earth, roaming lush valleys inexplicably buried under the ice caps, the deepest part of the oceans, as well as on other planets. For paleontologists the idea of living dinosaurs is well accepted. The remarkable discoveries in the Cretaceous rocks of Liaoning China over the last two decades have revealed an incredible diversity of small feathered predatory dinosaurs that irrefutably show that birds evolved from small coelurosaurian theropods. The record of both skeletons and feathers is so well documented that for paleontologists the dividing line between theropods and birds has disappeared. We now know of many feathered, non-bird, theropod dinosaurs, some of which were capable of gliding. In an evolutionary sense not all dinosaurs went extinct at the end of the Cretaceous period. 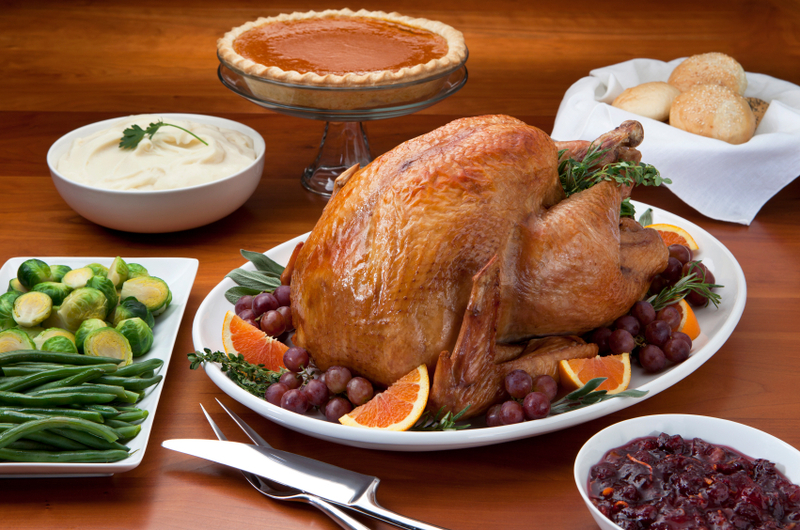 Some, the birds, survived, surround us today and frequently grace our dinner tables. 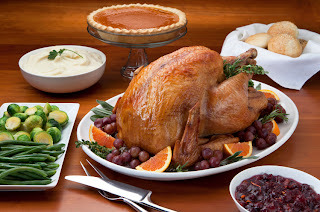 A tasty galliform-maniraptoran-coelurosaurian-theropoda-saurischian-dinosaur, with veggies. Plucked of course! But there are fossils that at face value seem to show that more “traditional” dinosaurs did survive the great end Mesozoic extinction. In the late 19th century large serrated teeth, compressed and blade-like, were discovered in post-Mesozoic age rocks in South America. They looked very much like the teeth of large theropods and were thought to indicate the long term survival of predatory dinosaurs. 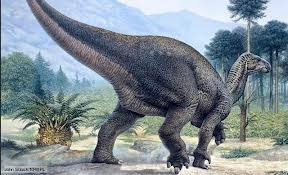 Not everyone was convinced they were dinosaur, but they certainly looked dinosaur, and if they had been found in Mesozoic age rocks no one would dispute their dinosaurian affinities. But they weren’t in Mesozoic age rocks --- so what group of animals did they belong to? The dinosaur like tooth of a sebecosuchian crocodilian. Later discoveries of the similar teeth in skulls revealed that they belonged to a very peculiar group of extinct crocodilians known as sebecosuchians. In living alligators and crocodiles the skulls are flattened and the teeth are conical. Sebecosuchians are quite different crocs. Their skulls are compressed side to side, making the heads taller than wide and the teeth are serrated compressed, and recurved. We now know that sebecosuchians were a long-lived group (Late Cretcaceous to Miocene) group of land-welling, running crocodilians, found in South America, Europe, North Africa,, and Asia. They have upright limbs and a nasty predaceous habit. So it’s not that surprising that they might have evolved a tooth structure similar to that of theropods. 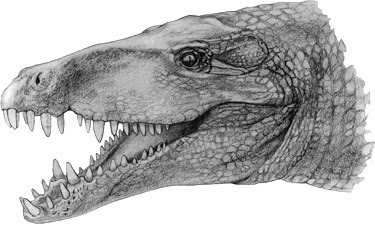 Sebecus, the crocodile with the dinosaur teeth. So the teeth of sebecosuchians turned out to be a matter of misidentification as dinosaur due to a lack of knowledge. However, other post-Mesozoic dinosaur fossils are in fact dinosaur fossils. Most striking is a tooth belonging to a plant-eating iguanodontid dinosaur found in rocks of late Miocene Age, approximately six million years old. How could this be? 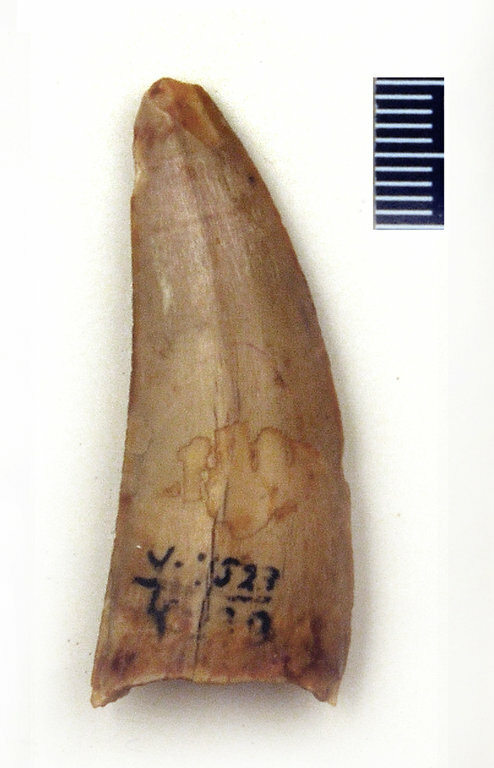 Were dinosaurs roaming all over France between 65 million and six million years without ever leaving any fossils behind, other than this tooth? Two iguanodontid teeth. A from the Miocene of France. B from the Cretaceous of England. Pound coin for scale. The real story of the French Miocene iguanodont teeth involves a phenomenon known as reworking. Fossils can be surprisingly durable and when the rocks they are enclosed in are re-exposed and eroded, the fossils reappear on the surface (which is how we find them). Once on the surface these fossils can be transported and reburied. Imagine, for example, fossil bones eroding out along the margin of an ocean, being moved by current along the shoreline and to deeper water where they are finally reburied. Of course, this is most likely to occur with small fossils, not larger bones that will break up into pieces. Restoration of a Cretaceous Iguanodon. Not only are teeth the smallest part of the skeleton they are also the hardest and most durable part of the skeleton because of enamel, the hydroxyapatite mineral covering the tooth crown. So it is teeth that have the greatest likelihood of being reworked as fossils. On top of it, fossil teeth are remarkably resistant to damage. One bit of clever experimental work placed fossil crocodilian and tyrannosaurid teeth in rock tumblers filled with sand and tumbled them the equivalent of 300 miles (480 km) of transport. Surprisingly, after all that tumbling the teeth showed virtually no wear, damage, or scratching. 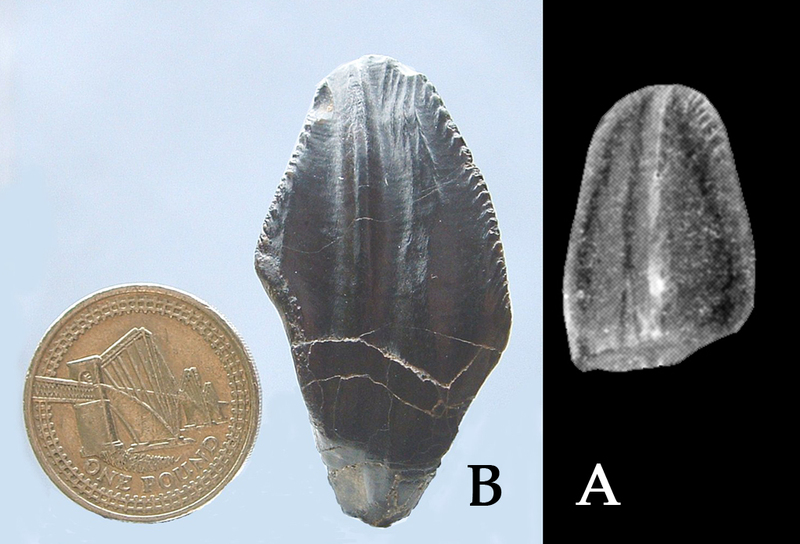 A 63,000,000 year-old Albertosaurus tooth exposed and loose on the surface in Canada. So the presence of dinosaur teeth in marine Miocene aged rocks is best interpreted as dinosaur teeth that were fossilized, exposed tens of millions of years later, reworked, and reburied in shallow marine waters. This is supported by the fact that the Miocene rocks are deposited directly on Cretaceous rocks, indicating that the ocean once exposed and covered the dinosaur fossil bearing Cretaceous rocks. Claims have also been made for fossils indicating the persistence of dinosaurs living in the Paleocene, the time period right after the end Cretaceous extinction event. However, in most cases the fossils in question are, again, fossil teeth, and fossil teeth of dinosaurs known from Cretaceous age rocks in the same area. This too seems a case of reworked fossils. Given the problem of reworking, what would be convincing evidence of dinosaurs living after the end Cretaceous extinction event? A pretty air tight case could made if a significant part of an articulated skeleton was found. Having the bones preserved in contact with one another in their life position would be unlikely if the bones had been reworked and reburied. No such fossils have ever been found, so while it is not inconceivable that in some area dinosaurs might have survived the end Cretaceous extinction event for hundreds of thousands of years, no evidence of such survival has yet been found. Extraordinary claims require extraordinary evidence. Reworking and reburial occurs with human remains but usually this is done through human, rather than natural, forces. Sometimes this occurs for good reasons, as we’ll see with the mummies of Ancient Egypt. Sometimes for pretty horrendous reasons, as we’ll see in the next section. The pyramids on the Giza Plateau of Egypt are the final resting places of great Old Kingdom Pharaohs. Although the pyramids are colossal structures and required immense effort and expense over many years to construct, they failed to protect the Pharaoh's mummified remains. All burial chambers in the pyramids were looted and stripped of their valuables millennia before being explored by archeologists. The mummy and wooden sarcohpagus of Ramesses II recovered from the cliff cache at Dier el-Bahari in 1870. In the New Kingdom, pharaohs were buried in the Valley of the Kings in large and complex multi-room chambers excavated directly into the bedrock of the valley. Alas, this turned out to be no more successful at protecting the royal remains than were the pyramids. Many burials in the Valley of the Kings were broken into and looted in ancient times. By the 21st Dynasty (~970 BC) the situation had become so intolerable that the priests opened many of the remaining tombs, gathered up the mummies and funerary objects and placed them collectively in a cache high up in the mountains of Deir el-Bahari (DB320). 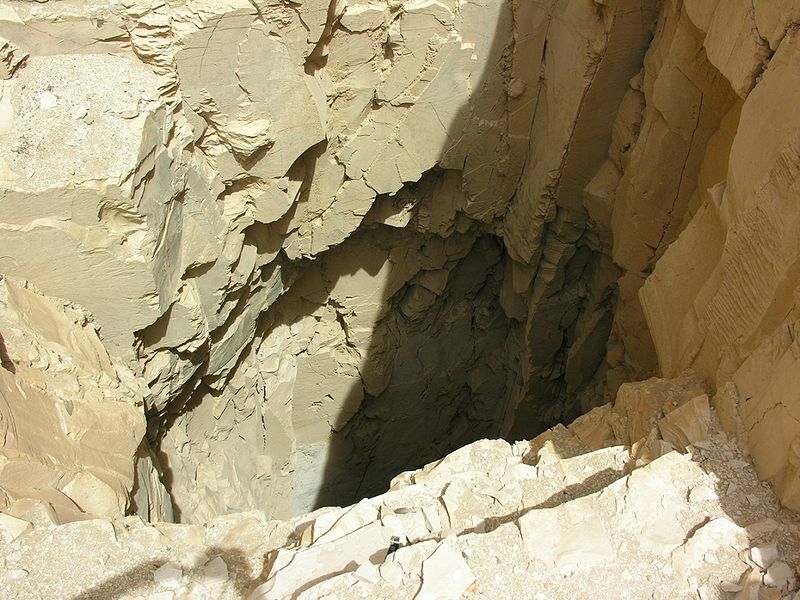 The vertical shaft leading to the cliff cache of royal mummies at Deir el-Bahari. There they remained, unmolested until 1881 when the German Egyptologist Émile Brugsch was lowered down a vertical rock shaft and, using a torch for light, gazed up the remains of 50 royal mummies and thousands of funerary objects piled up in a single chamber. That moment must have been almost as exciting as finding a dinosaur skeleton. Papal politics during the first millennium CE was a political blood sport --- literally. Popes often met a violent end, some were poisoned (John VIII) , had their eyes gouged out and nose and lips cut off (Pope Stephen XI), killed by a jealous cuckolded husband (Benedict V), strangled, imprisoned, had their skulls crushed with hammers, or simply disappeared. In one period of 32 years (872-904) there were no less than 24 popes, one of whom held office for ten years! Between 896-904 there were nine popes, as many as were elected during the entire twentieth century. 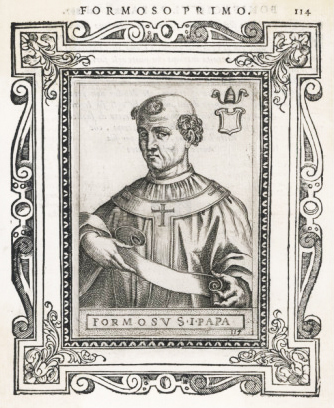 However, the pope of most interest to our discussion of reworked, transported, and reburied remains is Pope Formosus (891-896). 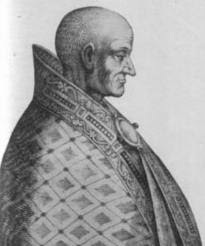 Pope Formosus, a humble looking man with spectacularly complex post-mortem adventures. The political forces and intrigues behind what happened to Formosus are much too complicated to recount here. For that fascinating background to our tale I refer the reader to the delightful and eye opening books by Brenda Lewis and E.R. Chamberlin. Suffice it to say that Pope Formosus made some very, very, very powerful enemies. 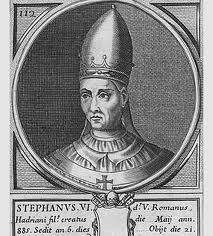 Formosus' nemesis, Pope Stephen VII. Formosus died in 896. In 897 Pope Stephen VII (also, ironically known as Pope Stephen VI) announced that the dead Pope Formosus would stand trial for a variety of “crimes”. Formosus’ moldering corpse was dug up (reworking event number 1), dressed in papal vestments, and hauled into court (transport event number 1) where it was placed on a throne. Pope Steven screamed, ranted, and railed at the body. Not surprisingly, the clergy forming the “jury” found Formosus guilty on all counts. 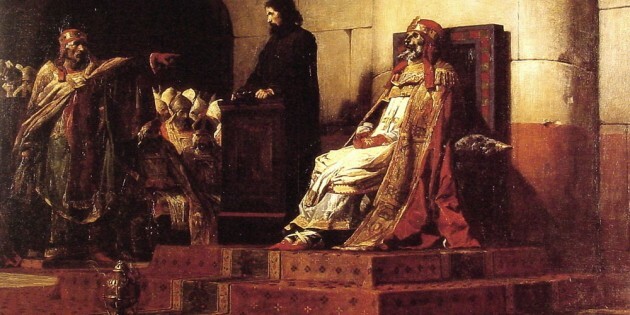 Jean-Paul Laurens' spectacular 1870 oil painting Le Pape Formose et Étienne VII (Pope Formosus and Stephen VII), rendering a touching scene of the cadaverous, moldering body of Pope Formosus on its papal throne (right) being subjected to a vigorous cross examination by Pope Stephen VII (left). But how, you ask, do you punish a corpse? Immediately upon conviction Stephen stripped the decayed body of its vestments and clothed it in peasant dress. The three fingers of the right hand, by which Formosus had given his benedictions, were cut off and the body reburied in a common grave (transport event number two and reburial event number 1). However, upon further reflection Stephen decided that was not quite enough punishment. He had the body exhumed again (reworking event number 2), dragged through Rome (transport event number 3) and, after having weights attached, tossed into the Tiber River (reburial event number 2). Secret supporters of Formosus worked with local fisherman to retrieve the body (reworking event number 3) and secretly buried in a graveyard (transport event number 4 and reburial event number 3). In August 897, only months after the Cadaver Synod, Stephen VII was deposed and strangled in prison. Pope Theodore II reigned for only 20 days in late 897, but during that brief time he had Formosus exhumed again (reworking event number 4), clad in papal attire, brought back to St. Peter’s (transport event number 5) and reburied (reburial event number 4). Never let a job go uncompleted: the cadaver synod juror and later pope Sergius III. However, our sordid tale is not quite over. Ten years later Pope Sergius III, who had been a co-judge at the Cadaver Synod, had Formosus exhumed yet again (reworking event number 5), cut the head off the corpse, cut off three more fingers, and had it again tossed into the Tiber (transport event number 6, reburial event number 5). Proving the old adage that you can’t keep a good man down, the headless corpse of Pope Formosus was found tangled in a fisherman’s net (reworking event number 6). Once again, the remains were taken back to St. Peter’s (transport event number 7) where he was again buried (reburial event number 6) and remains peacefully to this day. Makes the reworking history of a French Miocene iguanodont tooth seem like mere child’s play, n'est ce pas? Argast, S., Farlow, J.O., Gabet, R.M., and Brinkman, D.L. 1987. Transport-induced abrasion of fossil reptilian teeth: implications for the existence of Tertiary dinosaurs in the Hell Creek Formation, Montana. Geology 15(10): 927-930. 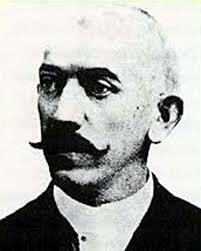 Buffetaut, E., Cuny, G., and Le Lopeuff, J. 1991. French dinosaurs: the best record in Europe? Modern Geology 16: 17-42. Buffetaut, E., Pouit, D. and Taquets, P. 1980. Une dent de dinosaurien Ornithopode remaniee dans le fauns miocenes de Doue-Douce (Maine-et-Loire). C.R. somm. Soc. Geol. Fr., fasc. 5: 200-202. Chamberlin, E.R. 1986. The Bad popes. Dorset Press: 320 pages. Colbert, E.H. 1946. Sebecus, representative of a peculiar suborder of fossil crocodilian from Patagina. Bulletin of the American Museum of Natural History 87 (article 4): 221-270. Sebecus head restoration: Colbert 1946. Perhaps a delicate flower? Nope, just the scolex of the extant rhinebothriidean cestode Rhinebothrium. But you already knew that. Life comes in a kaleidoscope of sizes, morphologies, and ecologies. From the majesty of a soaring eagle to the beauty of an orchid, the natural world has inspired philosophers, artists, and scientists from antiquity. A simple walk through a forest can be soothing and inspirational, even if you don’t know the name of any of the plants and animals you pass by. But then there’s those damn parasites. Like the crazy uncle everyone tries to ignore, parasites are an uncomfortable reminder that “Except for the grace of natural selection, there go I.” Parasites cause immeasurable pain, discomfort, or death to billions of organisms every year. But they are also, as Carl Zimmer has written, important drivers of evolution, control populations, and sometimes crucial to the functioning and survival of entire ecosystems. Nature does not have morality and parasites are not mean, bad, or evil. They are just the result of the relentless selection pressures of evolution. Putting aside human prejudices, parasites are really wonderful creatures specialized in remarkable ways to live amazing lives. 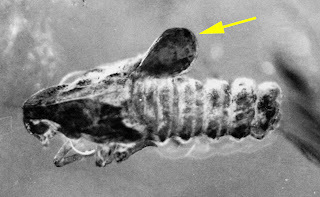 Parasite of the Day (http://dailyparasite.blogspot.com/) is a fascinating blog dedicated to highlighting the diversity of plants, animals, and unicellular organisms that live the parasitic lifestyle. You should visit it regularly. Take some time to peruse the back posts --- they will reveal a weird and wonderful world that few are aware of. In a post from Jan 1, 2011 they estimate that by featuring one parasite per day, it would take their blog several millennia to document the incredible diversity of parasites (http://dailyparasite.blogspot.com/2011/01/after-one-year-just-tip-of-iceberg.html). Cymothoa just doing its tongue thing. One of my all time personal favorite parasites is Cymothoa exigua, a crustacean that eats the tongue of a fish and then attaches to the fleshy stub to function as a new tongue, getting sustenance from the fish’s blood and mucus! 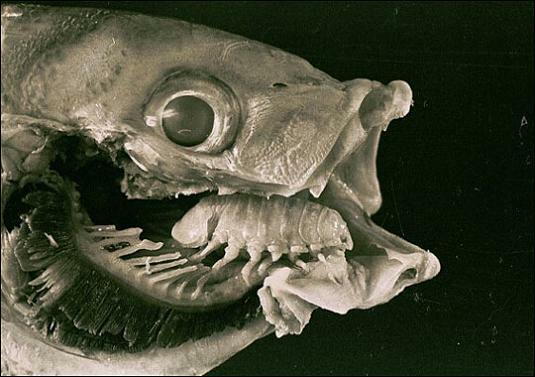 The parasitized fish seem to survive and do fine with their new tongue. As can be seen at Parasite of the Day, parasites are often, of necessity, of small size and many of them have few, if any, hard parts. Because of these facts their chances for fossilization are very low. Occasionally, however, we are afforded a glimpse into parasites of the ancient past. They are often best seen in amber, the fossilized, oozing sap produced by a variety of trees. Preservation in amber can be exquisite with even the finest of details easily seen. Arrows point to four parasitic mites attached to the abdomen of an adult midge in amber. There are many cases where external parasites, such as mites, are preserved in amber still attached to their hosts. The sac bearing a parasitic dryinid wasp larva on an insect in amber. Living dryinid wasps are parasitic, with larvae that live in sacs on the outside of their insect hosts, and slowly consume their host from the inside. Adult dryinids have been found in amber along with specimens of other insects bearing the external sac of the wasp’s parasitic larva. 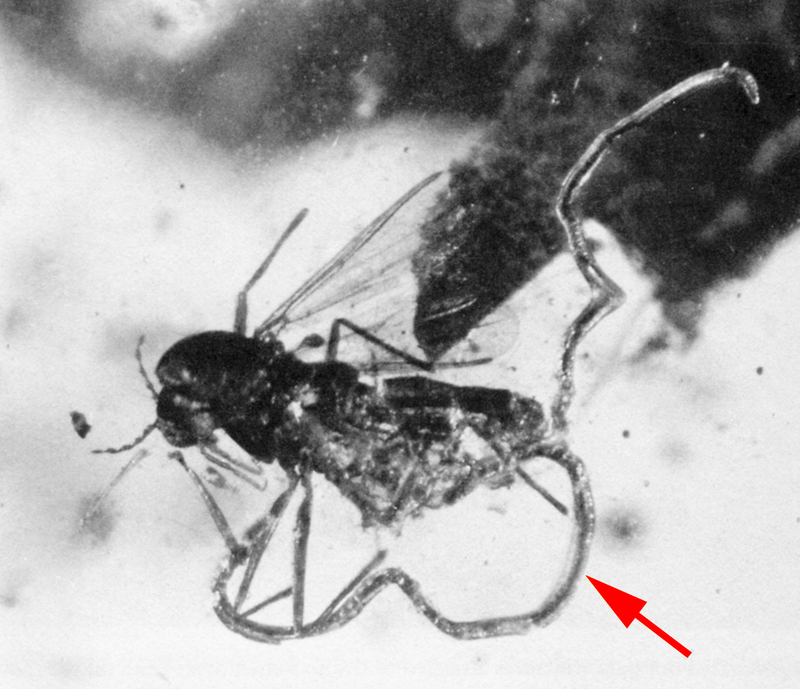 However, many parasites are internal but even their fossilized remains show up. Nematode worms are parasitic on a wide variety of arthropods, growing inside their host. In some cases large numbers of juveniles are shed that mature later outside the body. Over a hundred juvenile nematodes can be seen trapped in amber as they emerged from their female fruitfly host. 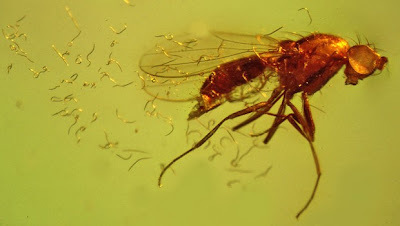 A single, large nematode, preserved in amber in the act of bursting through the body wall of a midge. In other nematode parasites a single worm grows to adulthood inside its host, until bursting through the body wall, a la the chest bursting xenomorphs on Acheron (LV-246) in the Zeta II Reticuli system. More than one insect in amber has been preserved in its death throws with the parasitic nematode, sometimes longer than its host, partially sticking out of its host. A just published paper by Paula Dentzien-Diaz and colleagues is an important contribution to palaeoparasitology and describes a spectacular (but very small) parasite of ancient sharks. This is not, however, from amber but from a coprolite, i.e. fossilized feces. As part of a paleoecological study, the authors collected some 500 fish coprolites, from ancient pond deposits in the Rio do Rasto Formation in the Parana Basin of Brazil. These rocks are Permian in age, abut 270,000,000 years old. As part of the study, a number of the coprolites were thin sectioned at various angles and examined for inclusions, such as bone fragments, that might provide insight into ancient predator-prey relationships. In one of these coprolites there was an unexpected scientific discovery. The Permian shark coprolite from Brazil in external view. Note spirals concentrated at left end. The coprolite is classified as a spiral heteropolar coprolite, meaning that it has closely spaced whorls concentrated at one end, a structure indicative of shark origin. The coprolite is not large, 5cm x 2 cm (2 in x .8 in). Within the coprolite are nearly very 100 small, ovoid, smooth shelled eggs packed together in a segment 4mm x 1mm. Thin section of the coprolite slowing the mass of small eggs (left) and a close up (right). Photo of the fossilized tapeworm egg with preserved embryo still inside (left) and interpretive drawing of specimen (right). 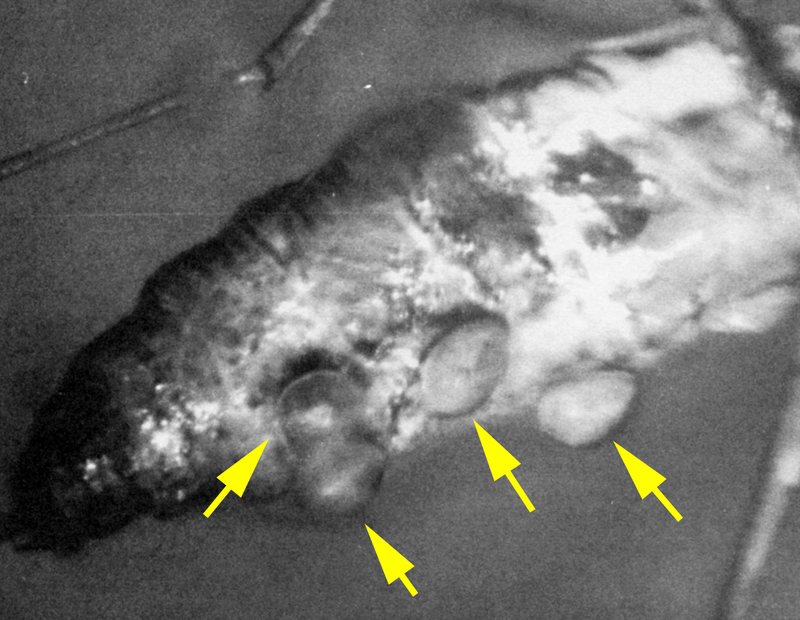 The details of the morphology of these fossil eggs is very similar to those of modern tapeworms. 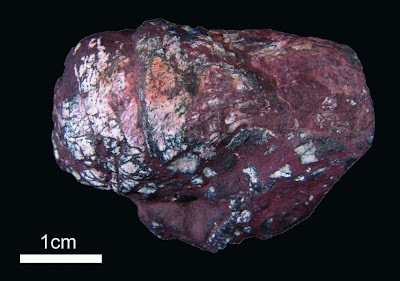 One of the eggs in the Rio do Rasto coprolite is so preserved well that parts of a developing embryo can be seen inside. A modern tapeworm. The scolex is at the thin end and attaches to the hosts gut wall. The segments grow larger as they move away from the scolex and break free when they are full of fertilized eggs. 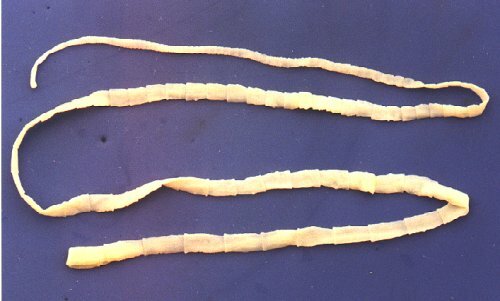 Tapeworms live in the intestines of vertebrates and can reach lengths of 37 feet and live up to 25 years in humans. 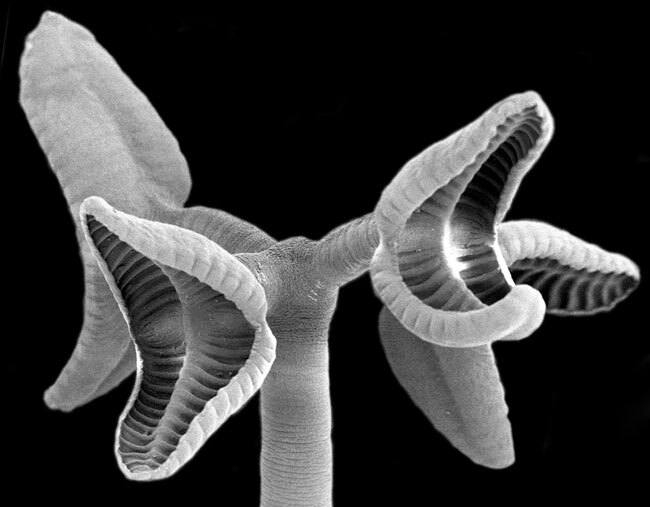 The head end, or scolex, is small and the scolex of each species bears a unique arrangement of hooks, cups, and other structures by which it attaches to the gut wall of the host. The body is composed of segments that are continually added at the head and become larger with age. Each segment contains eggs and when the eggs are mature the segment breaks off and leaves the body in the feces, to eventually infect other hosts. Simply delightful! Tapeworms often have complicated lifecycles, with different stages infecting different kinds of hosts, only reaching their reproductive state when comfortably ensconsed in the guts of their final host. So the eggs in the coprolite indicate that these Permian tapeworms used sharks as their final host. This tapeworm discovery is a fine example of serendipity in paleontology. Although Paula Dentzien-Diaz and her colleagues were studying the coprolites, they were not looking for parasites. But careful observation turned up these small, delicate, yet well preserved fossil eggs. Only one of the coprolites that were sectioned contained the eggs and one of the thin sections fortuitously passed close to the eggs so they could be seen, and thus the oldest case of tapeworm infestation became known. If things had been done only slightly different, these ancient parasites might well have remained unknown. Tapeworms have long been a plague in humans, living for decades in the gut, absorbing nutrients from the food that passes through the intestine, and producing hundreds of thousands of eggs that are passed out in the stool. 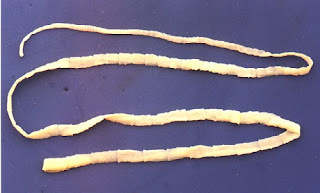 Those with a tapeworm infestation suffer a wide variety of ailments from the infestation, and since the tapeworm is stealing nutrients, loss of weight is one. 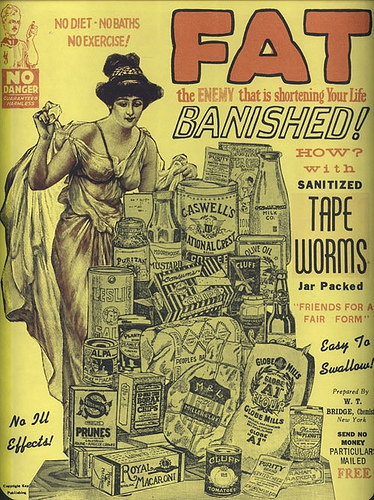 Between 1900 and 1920 there were several diet aids introduced trumpeting that they contained tapeworm eggs. Take the aid, get infected, eat to your heart’s desire, AND STILL LOSE WEIGHT! The truth of the ads is uncertain as no samples are available for analysis and one cannot rule out that the diet aid was just a bit of food, with no eggs at all. Can you imaging false advertising claims for a weight-loss product? Who could have imagined! Poinar, G.O. 1992. Life in Amber. Stanford University Press, Stanford: 350 pages. Poinar, G. and Poinar, R. 1994. The Quest for Life in Amber. Helix Books, Addison Wesley Publishing Co.: 219 pages. Zimmer, C. 2000. Parasite Rex: Inside the Bizarre World of Nature’s Most Dangerous Creatures. Free Press: 298 pages. DAN CHURE: I have been the paleontologist at Dinosaur National Monument for 34 years. My main research interests are dinosaurs & the ecosystems they lived in. I am also interested in fossil resource management & preservation, & the impacts of 20th century warfare and social revolutions on fossil collections & scientists. This blog is personal and not an official blog of Dinosaur National Monument or the National Park Service. 1906 San Francisco in Ruins - Zoomable!